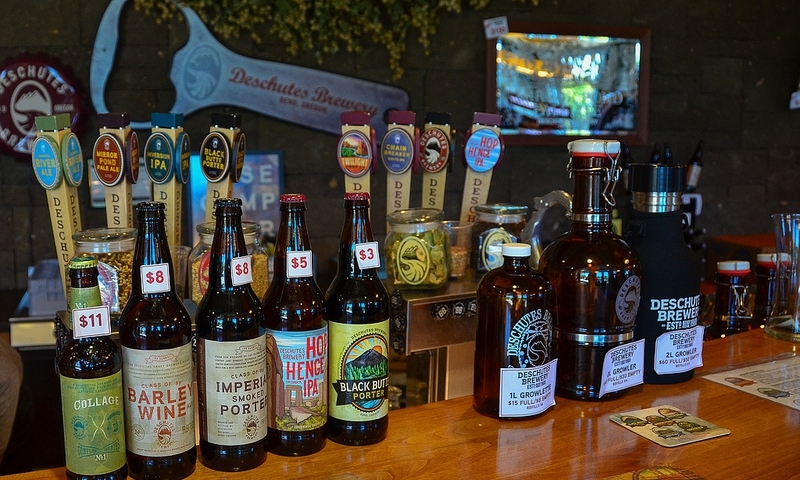 Deschutes Brewery, Oregon, which overlooks the scenic Deschutes River, is home to award-winning hand-crafted beers, and the brew house offers tours for all ages and tasting room samples for adults. Named for the Deschutes River, Brewery activities began in 1988 as a brew pub. Today there is a pub in Bend and Portland, and Deschutes Brewery ships their fine beers throughout the west. The Deschutes brewing facility produces seven year-round brews, four seasonal ales, plus the Bond Street and Reserve series. From US Hwy 97 Colorado Exit #138, west. At the traffic circle take the first driveway on the right. From Hwy 97 Business Loop turn west on Franklin Street, left on Wall Street, right at Colorado Avenue. At the traffic circle take the first driveway on the right. Guided Brewery Tours Monday – Sunday at 1pm, 2pm, 3pm and 4pm. Tours are limited to 15 guests. Come early to reserve a space. The gift shop is open Monday – Friday, 8 to 5 pm; Saturday and Sunday, noon to 5 pm. The Tasting Room is open every day, noon to 5 pm. Tours of the brewery and tasting room are free.